Goodbye… And thanks for all the fish. Vega is done. She had her last intrathecal chemotherapy and her final bone marrow aspiration. We left the Marsden without any bells or whistles and no dancing down the hallway either. In fact, it didn’t feel like an ending at all. 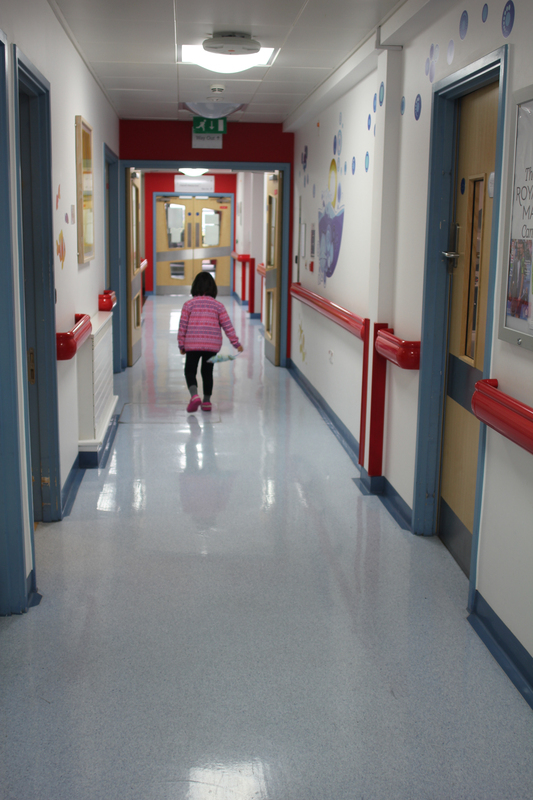 When Vega’s port needle was removed, the nurse asked us if we had our next appointment date (they always do), we didn’t say goodbye to anyone, didn’t high five anyone, thank anyone… And I guess when it comes to the Marsden it isn’t an ending at all. We will be with them for years to come, for long term follow ups, for echoes and port removal. Rather then an ending they only see us transitioning from one part of the treatment to the next. I more or less held it together while we were at the Marsden, but once we were in the car to go back home I cried. I am sure I qualified as a dangerous driver because my vision was definitely impaired by all those tears. Yet I did not stop by the road side to calm down. I drove. I drove away. And the further away I got from the hospital the less I had to cry. I suddenly felt so empty. I felt empty of energy, empty of purpose. But I also felt empty of stress and empty of anxiety. I felt both spent and relieved. Vega and I drove to Beccy to pick up Lyra and Alys and found all the children outside the house, singing. They were all dressed up as waiters, had baked cake, made tea and hot chocolate, even drew a menu and made welcome posters for Vega. It was a wonderful antidote to that last dose of poison. So many of you have sent me messages today. Thank you all for thinking of us, for being part of our countdown and for being there for us, so unconditionally these last years. Whatever this is now- an ending, a beginning, a transition- I feel comforted in knowing you are all by our side. I wish I had some wise words for you, some kind of conclusion, something meaningful. But I don’t. I now feel like going to bed for a week. Or maybe the shower for a few hours, until I look like a shriveled prune. I need some time to ponder the thought that for the last two years one of my children had cancer. And as of today- no matter how long this may last- she doesn’t anymore.